Price includes some breakfasts, most lunches, all dinners (except transition night between tours in Guadalajara if adding on the Oaxaca tour), all beverages (except optional extra drinks), all hotel accommodations, all distillery tours and tastings, train transportation and luggage transfers from Guadalajara to Tequila. Air and taxi fare is NOT included. We reserve the right to adjust the final price accordingly if the exchange rate drops below 18 pesos to the US dollar. We will send out trip insurance information when you RSVP. HOTEL UPGRADES IN TEQUILA ~ Please read before RSVPing! There are basically two hotels that will work for us in the town of Tequila. Both are centrally located right on the square in the heart of town steps away from each other. Please specify your choice when you RSVP. The first is Plaza Jardin where we stayed with the 2014 tours. It’s a basic hotel without a lot of amenities but is clean and safe. Because it’s on the square it can also be a bit noisy sometimes, so if you’re a light sleeper, you may want to consider bringing earplugs. Lodging at Plaza Jardin is 100% included in the tour price and there is no additional upcharge for staying here. You can see a video and pictures of the hotel here: http://hotelplazajardin.com/. I highly recommend that you fly Volaris Airlines (https://www.volaris.com/) out of Tijuana. All of the flight schedules listed in the itinerary at the end of this email reference exact flight numbers. (These, of course, are subject to change.) Volaris is like the Southwest of Mexico and I actually find their planes to be smoother and more comfortable than Southwest. Their prices are ridiculously cheap to begin with but if you sign up for their email newsletter on their website, you’ll routinely get crazy cheap email offers of up to 70% off. If you play your cards right you can get your flights for well under $100 each. You may also want to think seriously about extending your stay in Mexico before or after our tours as you can fly from any of our destinations to Mexico City and from there to pretty much anywhere in Mexico (think Cabo, La Paz, Cancun, etc.) I recommend that you sign up for their email newsletter right now so that by the time you're ready to make a reservation hopefully you'll have received a discounted offer! And, if you’re flying out of San Diego, the new CBX (Cross Border Xpress) bridge in Otay Mesa is a total game changer. It takes you directly from Otay Mesa straight to the Tijuana airport for $16. When I went down for my initial recon, I took Lyft (for some reason Lyft was less than half the price of Uber going to CBX) from our restaurant to CBX for about $30, got my CBX pass, went through security, went through customs, bought a visa (you’ll need to buy one on the spot; they cost $30), walked across the bridge, went through security on the Mexico side and was at the boarding gate in 55 minutes flat from my front door. I would recommend bringing at least 2,000-3,000 in pesos (about $100-150) for taxi fare, tips and miscellaneous personal expenses. You’ll find the best exchange rates at the money exchange houses in San Ysidro but if you don’t have time to go there most banks can also provide that service. You can also get pesos at the airport for a bit of a premium or at an ATM once you’re down in Mexico. Please scroll down for the hour-by-hour itinerary at the end of this email but here’s a detailed overview of both tours. While we're definitely planning on sticking to this itinerary, there's a chance that one or two of the venues may be substituted. After crossing the CBX bridge from Otay Mesa to the Tijuana (TIJ) airport, we'll take the 9:40 Volaris morning flight #Y4 422 (flight numbers and times subject to change!) direct to Guadalajara. As of September, this flight was available for $73, but just like in the states, prices do fluctuate. I will send an email with easy, step-by-step instructions on how to purchase tickets on-line to everyone who registers for this trip. The flight down is just under three hours, but we cross two time zones so when we touch down in Guadalajara local time will be close to 2:30. From the Guadalajara airport (GDL) we'll take taxis to Hotel Morales in the historical central district. The taxi ride will cost about 350 pesos, so if 3-4 people share a taxi, you'll get the cost down to 75-100 pesos ($4-5) per person. (You'll get good at doing "taxi math" by the end of this trip!) Hotel Morales is a beautifully restored historic hotel right next to the famous Plaza and within easy walking distance to many of the centuries' old cathedrals and museums. After checking in and freshening up you’ll have a couple hours of free time before we go on one of our legendary horse-drawn carriage rides through the city. Those of you who went on our New Orleans Cocktail Tours several years ago will know exactly what I'm talking about. If you’d like, you can order a “para llevar” (to-go) cocktail from the hotel bar to take with you on the ride. We'll meander through the cobblestone streets of Guadalajara past the many old cathedrals, museums and government buildings en route to El Pilon de los Arrieros, an old school restaurant located in the historic "Las 9 Esquinas" (the 9 corners) square known for its restaurants that specialize in birria (a succulent braised meat dish). Owner Lupita will greet us with a specialty cocktail and guacamole to start, followed by tortilla soup, birria (of course! ), barbacoa, and the local flan-like dessert jericalla. Beer, wine and tequila will also be free flowing. After an amazing dinner in their tropical garden dining room we'll make the five-minute walk back to the hotel for the night. After a good night's sleep, we'll check out of the hotel and grab a taxi (about $2 per person) to the train station where we'll board the Jose Cuervo Express, a meticulously restored vintage train with coach cars, a dining car and a luxury club car. Complementary coffee and breakfast pastries and fruit will be served at the train station before we board. Our group will take over the private luxury club car where we'll enjoy unlimited premium Cuervo tequilas and tequila-based cocktails along with a light lunch during the leisurely paced, two plus hour ride from Guadalajara to the magic pueblo of Tequila. Along the way we'll pass through the towns of El Arenal and Amatitan where endless vistas of agaves will replace the usual grape vines we're so used to seeing on our wine tours. Once in the town of Tequila we'll make a five-minute transfer from the train to a bus that will take us directly to the center of town. The drop-off point is conveniently located two blocks from our hotels. We'll check in and then enjoy a couple hours of free time to explore the square, or grab a quick bite or drink, or to just relax by the pool or on the roof deck. For the adventuresome I'll take whoever wants to join me to the oldest bar in Tequila, La Capilla, to share a batanga. (http://tastetequila.com/2011/the-batanga-official-tequila-drink-recipe/) Owner Javier has been pouring drinks here for over 70 years. Lots of history here (and strong drinks, too) but we'll go easy on the tequila and share a drink because we want to be in prime form for the rest of the day. 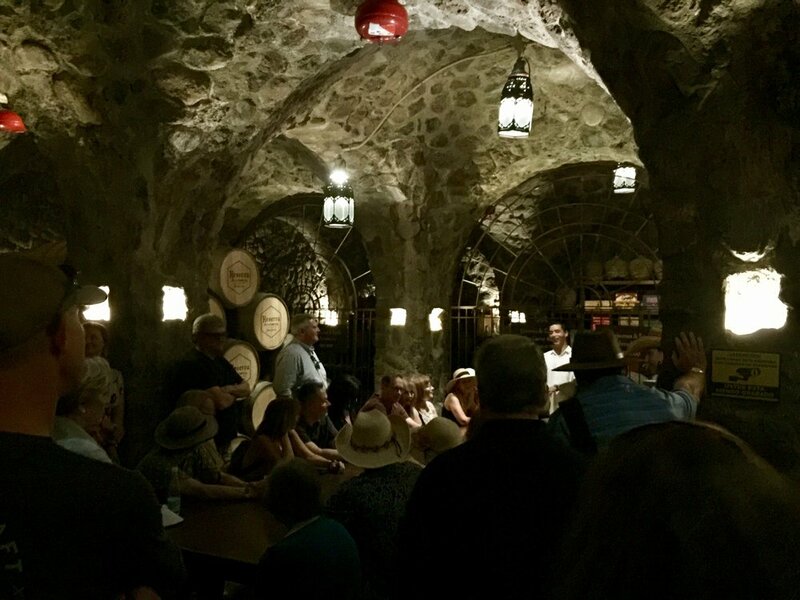 Then we’ll meet up at the Jose Cuervo “La Rojena” Distillery for a tour and tasting followed by a private visit to the legendary "Reserva de la Familia" caves for barrel tastings of this ultra-premium aged tequila. After the Cuervo tour we’ll switch gears from uber big to uber small. We’ll walk to La Alborada, a micro distillery about five minutes away. We'll tour this tiny distillery and then head over to their tasting area to sample some of their premium tequilas. Most people think that lime and salt are the perfect accompaniments to tequila but here we'll learn why orange and cinnamon work much better. We'll also sample some of their delicious tequila-based liqueurs. After what will no doubt be a satisfyingly comatose sleep we'll wake up raring to go Sunday morning. There are half dozen places within a block of our hotels to enjoy a traditional Mexican breakfast or just some fresh fruit if you want to eat something lighter. My only complaint is that I have yet to find a great cup of coffee here so if you're addicted to your favorite Starbucks concoction, be prepared to go through withdrawals. After breakfast we'll take a walk through history down the cobblestone streets to the oldest part of town where some of the original distilleries are located. 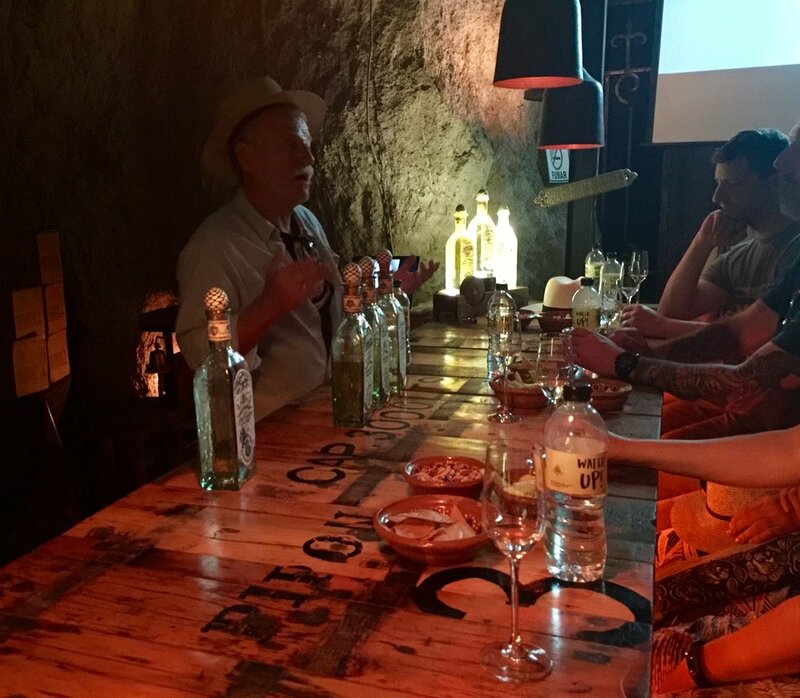 Some have long been abandoned, some have been restored and are still producing tequila the old school way, and some have been renovated and are producing Tequila with modern equipment and methods. First stop will be Fortaleza, one of the original Sauza distilleries constructed 140 years ago. With the advent of modern equipment and distilling processes, Fortaleza sat dormant for almost 40 years and was eventually turned into a museum before being restored back to its original state in 2000. The first batch of tequila was bottled in 2002 and was produced exactly the way it was 140 years ago using the same meter-thick brick ovens, the same stone mill and the same copper pot stills. We’ll tour the grounds (including their miniature version of San Francisco's Golden Gate Bridge!) and then sample their Tequilas in a private underground bar in the back of their caves. From Fortaleza we’ll walk 3-4 minutes down the street past Los Lavaderos (the old stone washing trough diverted off the river where villagers used to wash their clothes years ago) to Orendain Distillery. We’ll tour this huge facility and then settle into their gardens for an intimate private tasting, lunch and Cantaritos. Cantaritos are a refreshing, icy cold, tequila-based drink made with freshly squeezed grapefruit, lime and orange juices plus lime soda (usually Sprite), salt and chile. (I prefer them without the salt so will order everyone’s that way but there will be salt on the table for you to add on your own if you'd prefer to try the traditional version.) They are served in a clay mug for you to take home as a souvenir if you wish. After lunch at Orendain we'll take a walk along an elevated bridge above the river that provides an excellent view into the backsides of several ancient abandoned distilleries. Rumor has it that one of the big distilleries is trying to purchase this property and re-develop it into a hotel but, for now at least, it’s definitely an eerie walk through the past. We’ll continue walking a couple blocks past the abandoned distilleries back towards town to El Llano Distillery where the premium Arette Tequilas are made. This is one of the older distilleries that has been gradually modernized throughout the years so it makes for a good "crossover" example. 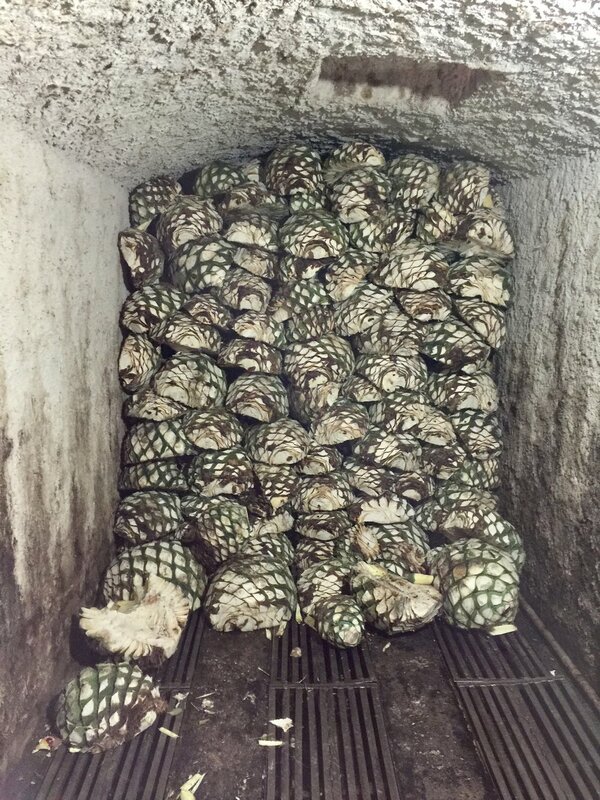 We'll see the autoclaves (huge cylindrical steam ovens) where the agave hearts are steam roasted for up to two days. Then we'll see the shredders, fermentation tanks and stills before heading across the street to the Arette barrel room and their little corner bar to sample the finished product and have an artisanal cocktail concocted by local celebrity bartender Andres. After Arette we'll make the five-minute walk back to the hotels for a couple hours of down time to relax or do some shopping or exploring on your own. After re-energizing for a couple of hours we'll meet up again at Antigua Casona, hands down my favorite restaurant in Tequila. (I loved this restaurant so much that when I was doing recon I went back two nights in a row for the exact same food … something I rarely do!) Like Cholula, it’s conveniently located right on the square steps from both hotels. We’ll start with appetizers paired with the premium Gran Orendain Blanco. Then we’ll switch gears and do a couple of cocktail pairings: an apple/spinach salad paired with a papaya/habanero margarita followed by a black prawn aguachile paired with a rosemary smoked (yep, they actually torch the rosemary right in front of you) margarita. Then we’ll have a traditional beef stew (I know stew sounds awfully pedestrian but, trust me, this is the best I’ve had in my life) paired with a premium anejo. Finally, we'll end with just a simple scoop of vanilla ice cream to finish off the evening. After dinner we’ll walk (waddle?) back to the hotels for the night. After breakfast Monday morning we’ll make the five-minute walk to Sauza Distillery. Sauza is a huge operation that does the process much differently. While everyone else first roasts the actual agave pinas, and then shreds them to extract the juice before fermentation and distillation, Sauza shreds the agaves first and then essentially “roasts” the extracted juice. Predictably this raises lots of eyebrows from purists but hey, you can’t argue with success! Anyway, we’ll tour their ginormous facility and then we’ll take shuttles just outside of town to their agave fields where we’ll watch a "jimador" prepare a "pina" (the heart of the agave used to make tequila) by trimming the leaves with a "coa" (a sharp, spade-like tool). After that we’ll get a first-hand lesson in sustainability where you'll get to plant your own agave. Because agaves take 7-9 years to mature, it’s important to keep the pipeline always refilled with new plantings. 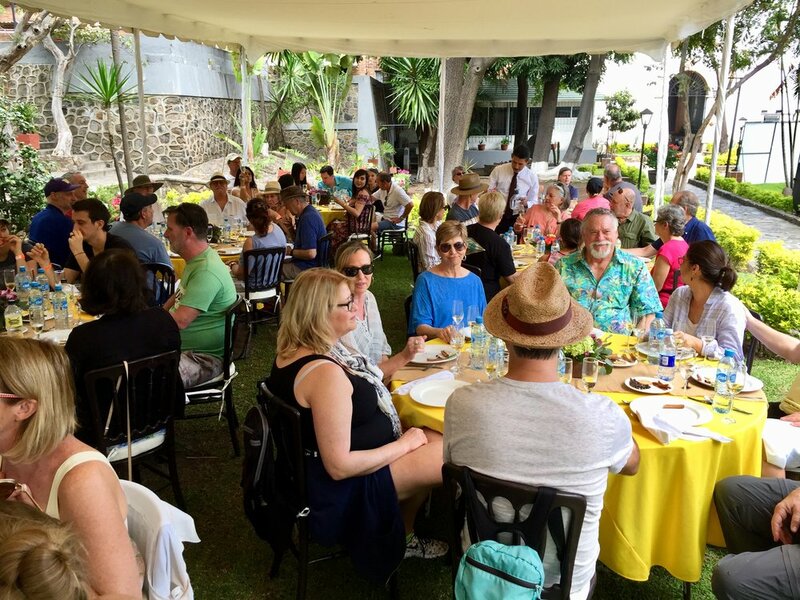 After the agave fields tour, we’ll head back to Sauza where we’ll have a delicious lunch in their spectacular gardens along with a tasting and cocktails. After lunch at Sauza the Tequila portion of the tour is over. From Tequila we’ll taxi back to Guadalajara (about an hour and a half and around 700-1,000 pesos ... about $12-18 per person depending how many people share the cab). Those of you going back home (or elsewhere in Mexico) can go straight to the airport and fly to your destination, while those of you going on to Oaxaca will check back into Hotel Morales for one night and then fly to Oaxaca the next morning. >>> This concludes the Tequila narrative. The Oaxaca narrative is listed on the Upcoming Tours page. 1. You MUST have a current passport to get back into the US and it must be valid for a minimum of six months past your return date. 2. You can bring ONE liter of Tequila or Mezcal back into the states. 3. Please note that this is a physical tour that involves lots of walking. Make sure to wear comfortable walking shoes. Flip-flops are OK but make sure they have a thick sole as the rough cobblestone streets of Tequila and Oaxaca will otherwise wreck havoc on your feet. 4. The weather should be fantastic with daytime highs in the 75-82 range with virtually a zero percent chance of rain.